Sterling silver flatware can be found in garage sales, heirlooms or in a forgotten box in the attic. Pieces handed down from generation to generation may lose their identity, be misplaced or become excessively worn. 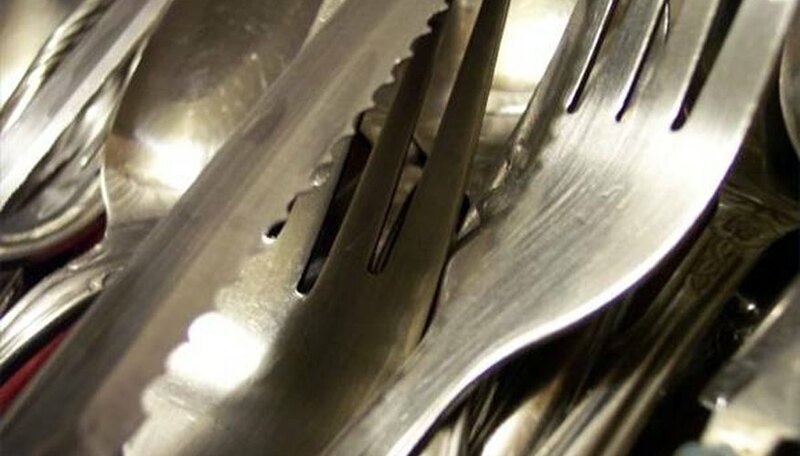 There are ways to identify, restore and replace sterling silver flatware settings. Look for special markings on the flatware. Markings are usually located on the handles, but they are sometimes found in different places. All silver flatware made after 1850 should have an identification stamp. Older or worn silver may be more difficult to identify. Examine the markings on the flatware. If the symbol .925 or Sterling is found it is sterling silver flatware. This marking indicates that the silver flatware was most likely made in the United States after 1850. Find a variety of stamps or markings on the flatware? This often signifies British-made sterling flatware. British sterling silver flatware can have up to six unique stamps on one piece of flatware. See the Resources section for a link providing pictures of British sterling silver flatware markings. These markings will indicate the city of origin, the date made or the producer of the flatware. Go to an antique silver dealer. If the markings are unique or rare, they may be difficult to identify as sterling silver flatware. Rather than poring through books of symbols, contact a local silver expert. To find a reputable dealer go to a store that sells sterling silver and ask for a recommendation. Ask a jewelry dealer to show you how to identify sterling silver. They are experienced in working with this metal. Most of the metal they deal in is stamped with the silver content, so older sterling pieces may not be familiar to them. However they can easily show you how to spot sterling versus silver-plated pieces. Confirm the flatware as silver. Through the stamped symbols on the piece, identify the maker, origin and age of the flatware. This will assist you in the future if you wish to add to or replace pieces in your set. Perform an acid test on the silver flatware. Kits are available for home testing (see Resources section). Or the acid test can be performed by a silver professional. Not all portions of a piece may be silver. A professional dealer will be able to identify the piece. See results of an acid test by the color change of solution on the silver. First, a small scratch is made in the silver, and the the appropriate acid test solution is applied. The solution will change color to denote if it is silver. A color change chart is available with kits or from silver dealers to interpret results. Add or replace silver flatware pieces using a professional dealer. There are shops that specialize in stocking unique, hard-to-find replacement pieces for china and flatware patterns. The Resource section has an example of one of these shops. Garage sale treasures can be found once you understand how to identify sterling silver from standard flatware. The history of pieces that have been handed down from generation to generation are sometimes lost. Do not give up if you cannot find markings on all of your flatware pieces. If even one piece in your set has markings, it is likely that all pieces are silver. Check all pieces carefully for unique markings.